This tutorial tip will discuss how to select an area of the canvas. Once you have selected an area of the canvas you can then use your selection or it’s inversion as a mask for inhibiting subsequent processing in masked areas. There are a number of different ways you can select portions of the canvas in v4. Selection is performed while in Selection operation mode. You can use the Operation : Selection menu to choose a number of different interactive ways to select an area of the canvas. The screen snap above shows the different interactive selection techniques. 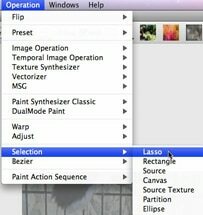 Choose the lasso selection option will bring up the Editor palette in Selection operation mode with the interactive lasso selection option active. All of the interactive selection options use the mouse or pen movement to interactively define a selected area. 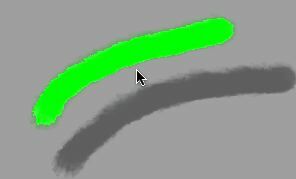 With lasso selection you draw a lasso area with the mouse or pen. As you draw a colored lasso line appears defining the area you are lasso selecting. Once you finish drawing the lasso area the screen will update as shown below, where the unselected areas are grayed out and the selected areas display normally. If you want to extend you existing lasso selected area, you can hold down the shift modifier key while selecting an additional area of the canvas. The newly selected area will then be added to the exiting selected area. Shift option selecting an area of the canvas will remove the newly selected area from the existing selection. You can use the t hotkey to move or translate an existing selection. Press the t key and then mouse down on the selected area and reposition it. You can use the r hotkey to rotate an existing selection. Press the r key and then use your mouse movement in the canvas to rotate the existing selection. 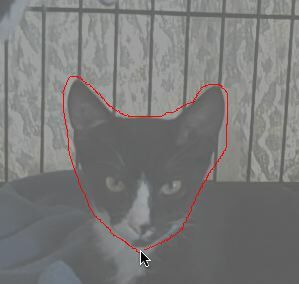 For this particular example i wanted to mask a processing effect from occurring in the area of the cat head i just selected. So i need to invert my selection after lasso selecting the head area. 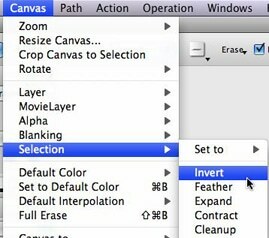 You can use the Canvas : Selection : Invert menu command to invert the selection. I also wanted to smooth out the sharp edges of the selection, so i used the Canvas : Selection : Feather menu command to feather or smooth the selection after inverting it. After inverting and feathering my selection i then wanted to use my selection as a mask for some image processing. I first switched to the image operation filter i wanted to use for my processing (Geodesic Recursive Growth in this particular example). I then turned on masking by turning on the Mask checkbox in the main operation toolbar. 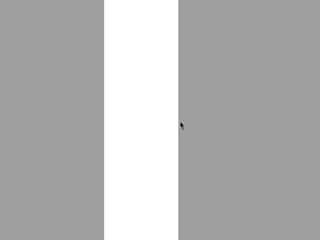 Once masking is turned on the deselected parts of the canvas gray out as seen below. I then pressed action and ran the image operation. 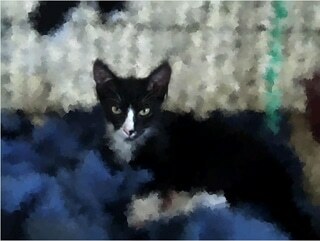 Because masking is turned on the unselected parts of the canvas will not be affected by the image operation. 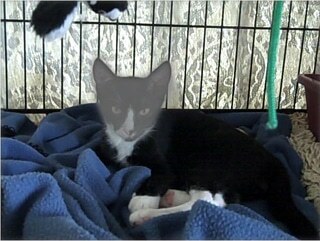 After the image operation concluded i then turned off masking by un-checking the mask checkbox. 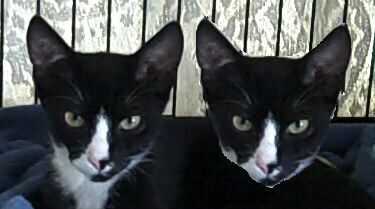 The result of the masked image processing is shown below. 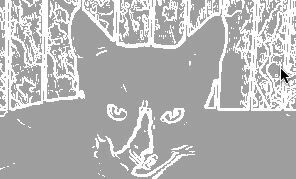 Notice how the masked cat head was not processed by the image processing effect while the rest of the canvas was processed by the effect. You can use selection masking to mask any Studio Artist operation, including painting. There are some additional mask options available for paint masking that determine how the mask is used to inhibit painting. You can choose these options by control clicking the Mask checkbox control in the main operation toolbar as shown below. You can also access these paint masking options via the Canvas : Layer : Paint Mask Type menu flags. Paint masking provides a hard mask to a paint stroke as shown below. Path masking creates a more natural effect by masking the paint path rather than hard masking the paint nib itself. This means that the complete paint nib is drawn at the edge of the mask as shown below. The screen snap below shows the difference between paint and path masking, paint masking leaving a hard mask of the paint brush nib while path masking allowing for a more natural paint appearance with the complete brush nib drawing at the edge of the mask. The Litho masking option is more of a specialty feature and works with dual fill paint synthesizer presets. The first fill algorithm is masked while the second wet fill algorithm is not masked. Litho masking can be used to simulate lithography printing effects where ink is masked to a screen or block print while subsequent rubbing of the print spreads ink from the initial masked areas. There are a number of different options available for interactively selecting areas of the canvas. We’ll briefly run through the different options below. Lasso selection works by letting you interactively draw a lasso area that then becomes the selected area after you are finished drawing the lasso area. 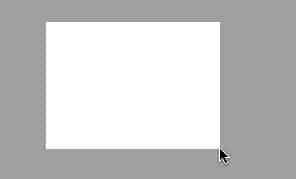 Rectangle selection works by interactively dragging out a rectangular area with the mouse or pen. 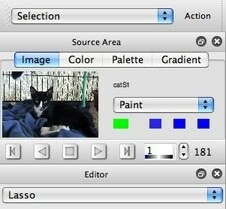 Source selection works by selecting a color range from the source image. You can choose to select based on local or global color. The initial start position of the mouse determines the initial source color selected. 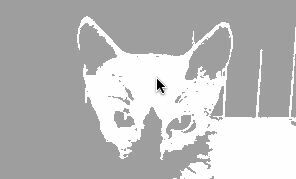 As you drag the mouse horizontally you are varying the range of color based off of the initial starting color in the source image that you are selecting. Canvas selection works by selecting a color range from the canvas image. You can choose to select based on local or global color. The initial start position of the mouse determines the initial canvas color selected. As you drag the mouse horizontally you are varying the range of color based off of the initial starting color in the canvas image that you are selecting. Source selection works by selecting a color range from the source texture (or edge) image. You can choose to select based on local or global color. 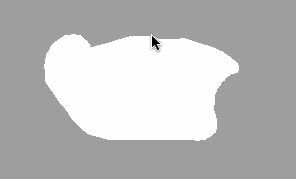 The initial start position of the mouse determines the initial source texture selected. 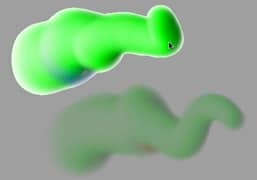 As you drag the mouse horizontally you are varying the texture range based off of the initial starting texture value in the source image that you are selecting. Partition selection is a useful feature or cropping a layer. It’s like rectangular selection except that the axis you draw out a rectangle with using the mouse is always pinned to be the full size of the canvas. Ellipse selection lets you draw out a ellipse area with your mouse movement. The ellipse can have hard of soft edges. Some of the interactive selection options like Source or Canvas offer a Growth parameter option. Local growth means that the selection grows from a local color at the start location for the selection. Global mean that the selection grows from all spatial locations with the initial starting color value for the selection. By grow we mean that as you increase the selection range the range of color from the initial start color that is selected increases. Here’s a simple example below. 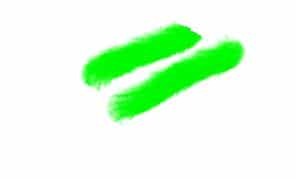 There are 2 paint strokes with the same color. If we mouse down on one of the paint strokes and select using Canvas selection and local growth, then only the paint stroke we moused down on is selected. This is because local selection will only extend the selection range from the initial color at the spatial position we moused down on. 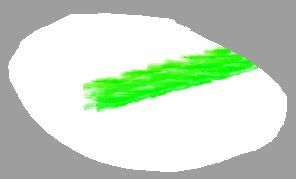 In order for the second green paint stroke to be selected the 2 paint strokes would have to be connected by green, but the 2 green strokes are painted on a white background. 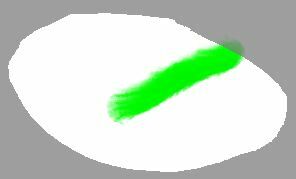 Since the selection is flowing from a local color range, the white background acts to inhibit the growing selection from getting to the second green paint stroke. If the Growth option is changed from local to global, then selecting the first paint stroke will also select the second one, since they are both colored green and selecting green in the first stroke selects green everywhere in the canvas when using global growth. You can move a selected area of a layer within the layer itself. To do this first select the portion of the layer you want to move. Then hold down the m hotkey and drag the selected area to a new position. 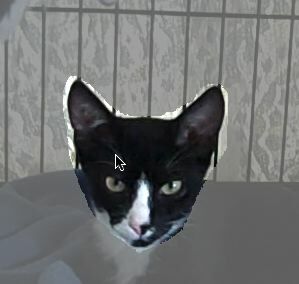 In the example above the cat head was first selected, and then the m hotkey was held down while the selected area was dragged to the right. Note that m hotkey movement makes a copy of the selected area that is moved to the new location. Note that if i had feathered the selection prior to movement i would have generated a smooth blend at the edges of the moved selected area as opposed to the hard transition shown in the example above.